Pick up from your hotel in Shanghai; fly to Guilin. Upon arrival, Guilin airport to hotel transfer. Visit the two reprentative attractions in Guilin city-Elephant Trunk Hill and Reed Flute Cave. The former is regarded as symbol of Guilin, lively with its body half in water and half on land. The latter, known as “the Palace of Natural Arts”, is a fantastic cave decorated by peculiar-shaped stalactites, stalagmites, and rock. Takes the Li River cruise along the Li River between Guilin and Yangshuo,highlight of any journey to Guilin, with stunning scenery. Arrive in Yangshuo, a beautiful town with idyllic countryside scenery. 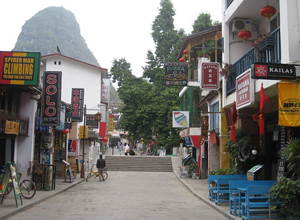 Visit the West Street, the oldest street in Yangshuo with a history of more than 1,400 years, attracting approximately 100,000 foreigners for its unique mix of cultures. Traditional folk arts, shops, cafes, restaurants and bars are all along the street. Back to Guilin airport to fly back Shanghai. Upon arrival, Shanghai airport to your hotel transfer. *China internal flights: Shanghai-Guilin, Guilin-Shanghai. Hello what is the cost for one adult and one 6 year old child for a weekend in June/July? Also what is the difference in rate if we book hotel in Guilin ourself? Thanks. Hi, could you let me know how much this would cost for 1 person? Thank you for your message. We just sent you an email about detailed tour itinerary and prices, please check it out. Hi, could you please tell me the price of the 2 Days Guilin Tour from Shanghai by plane and by train (2 people)? Thank you!